SAN JOSÉ, CA— Because when it debuted at the Burgtheater in Vienna, in January 26, l790, composer Wolfgang Amadeus Mozart (1756-1790) called COSI FAN TUTTE, “Opera Buffa,” the public assented that the work was a comedy. Nothing was further from the truth. 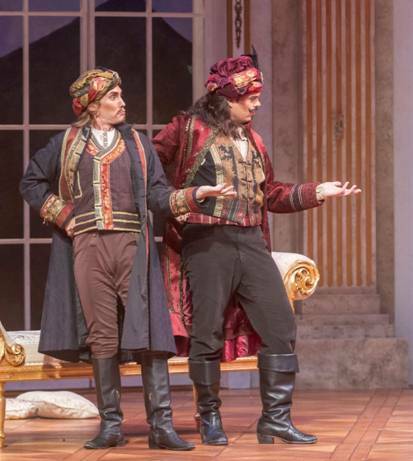 While little is known of this opera beginnings, it has been asserted by many, that the story was recommended to Mozart by Emperor Joseph II of Austria himself, with an allusion to some “infidelity” stories happening, during those years, in Vienna. What this may, or may not have been, the origin of COSI FAN TUTTE, what we know is that LORENZO Da PONTE wrote the story based on the subject of Fidelity in what is still considerd, a “perfectly symmetrical libretto”. While all the characters in his libretto are paired, each one has a completely different personality. COSI FAN TUTTE is the story of Don Alonso (MacKENZIE), a philosopher, who sitting inside the fencing gym where young soldiers are fencing, overhears two young men, Ferrando (DAVID BLALOCK) and Guglielmo (COLIN RAMSEY) talking about their future brides, Fiordiligi (AMANDA KINGSTON) and Dorabella (CASSANDRA ZOÉ VELASCO) fidelity. Interrupting their conversation, Don Alonso, comparing the fidelity of woman to the Arabian Fenix, that everybody believes in. but nobody knows where it is, Dpm Alonso bets the soldiers one hundred gold coins that in a day he could prove to them how easily their future brides, could fall in love with other men. But Da PONTE may have also wanted to teach his audience something about women, because after, naming the work “COSI FAN TUTTE, (which may be translated as All (women) are alike, (in this case unfaithful) he added the subtitle: “osia LA SCUOLA DEGLI AMANTI,” ( The word “osia” meaning (It is part of) “La Scuola degli amanti, " which may be translated as “("learning about this, is part of the school for lovers.” The Opera story demonstrates his premise. Sadly, “The unfaithfulness of women was not a subject matter people talked about in l791, so, after COSI FAN TUTTE was presented, Count Zinzerdorf noted in his journal that Mozart’s music was “charmante” and its subject “amusing” but Friedrich Ludwig Schröeder the famous German actor comment that Mozart’s work was “A wretched thing that belittles all women, and cannot please its female spectators and therefore it will never succeed.” caused damage to the opera, because being an actor, and an Austrian aristocrat, his verdict remained in force all over Europe for a century. 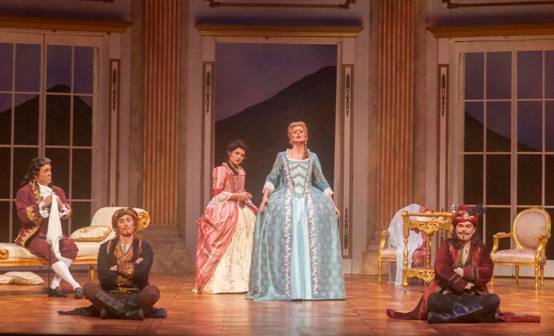 It took time, but at the end, “COSI FAN TUTTE” began to be recognized as Mozart’s musical masterpiece of beautiful transparent, melodies, harmonious sound, and perfectly proportioned. Directed it by BRAD DALTON, Opera San José presented the Opera in a creative set (which could be converted in seconds from a Gym, to the boudoir of the sisters’ house and to their garden) designed by STEVEN C. KEMP, with elegant costumes by ELIZABETH POINDEXTER,and a tuneful orchestra conducted by PETER GRUNBERG. One of the best arias that night was the “Farewell” terzetino (trio) in the key of E major, in the first act (sung by Fiordiligi, (KINGSTON) Dorabella (VELASCO) and don Alonso, (McKENZIE) in which the girls bid farewell to their lovers) that played in the muted strings of violins and violas and base pizzicatos, mixed with the tones of wind instruments heard in the background, conveyed to the audience a sound of mourning that was capable to touching our hearts. 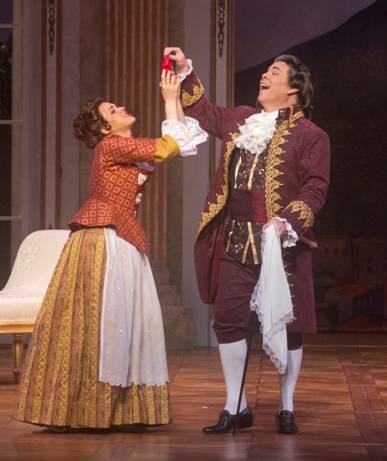 Five of the singers debuted in their Mozart’s roles in Opera San Jose on that night: Baritone MALCOLM MacKENZIE, in the role of Don Alonso. 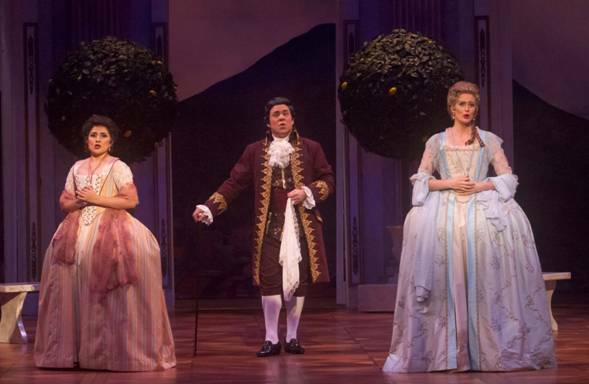 Tenor DAVID BLALOCK, who played the role of Ferrando, Soprano MARIA VALDES who played the role of Despina, Mezzo-Soprano CASSANDRA ZOÉ VELASCO, who played the role of Dorabella, and Soprano AMANDA KINGSTON who played the role of Fiordiligi and joined the resident company in the 2017-2018 Season. On opening night he singing of all the actors sounded beautifully. The tone of their voices is marvelous. In the acting part, however, while all the women and Don Alonso gave us a credible performance when playing their roles, our two heroes, Ferrando (BLALOCK) and Guglielmo (COLIN RAMSEY) exaggerated their dying too much. COSI FAN TUTTE is now a very popular opera in Europe. In Germany alone, more than 30 different versions have been recorded and is one of the most frequently adapted and re-written of Mozart operas. Opera San Jose’s version, was a first class performance.